The history of "Toro" begins on 3rd December 1906 thanks to a group of dissidents of the team of Juventus, who decided to found a team called Football Club Torino. The first national championship was won in 1927/28. Right during that period, on 17th December 1926, the stadium Filadelfia was inaugurated. The first Coppa Italia (Italy Cup) was won in 1935/36 against Alessandria. In 1939 Ferruccio Novo became the society's chairman, and he decided to purchase a group of important players between them: Bodoira, Bacigalupo, Toma, Borel II, Gabetto, Menti, Ferraris, Loik, Mazzola e Grezar. These were the protagonists of the second championship won in 1942/43, which was the first of five won by these players in the following seasons. A tragic accident stopped them: on the 4th of May 1949 at 05:05 pm the plane which took the players back home after a transfer to Lisbon, crashed into the Basilica of Superga. A new championship will be won almost 30 years later only, in the season of 1975/76. The lineup presented the so-called "Twins of goal", that are Pulici and Graziani. And the team was supported by the most deep-seated part of the city. Juventus Football Club (better known as 'Juventus' or, informally, 'Juve') is an Italian football society which has its seat in Turin, where it was founded in 1897. Together with the team of Torino FC 1906, it is the most important team in Piemonte. The team was founded by a group of young students who attended 'D'Azeglio high-school' of Turin, among which were Eugenio and Enrico Canfari, who used to gather on a bench (today jealously appreciated in the seat of the society) and who took inspiration from a literal licence of the Latin noun 'iuventus' (youth) for the name. Juventus is the team which most often has won in Italy with 40 official trophies won at national level: 27 championships, 9 Italy Cups and 4 Italy Supercups. With 11 official trophies won at international level: 2 qualifications for have been champion of the world, 2 qualifications of champion of Europe, 1 Cup of the Cups, 3 UEFA Cups, 2 Europe Supercups and 1 Intertoto Cup, Juventus is the second most qualified team in Europe and the third in the world. Juventus is the only team in the world that won all the official trophies at international level and in 1985 it was the first football society which won the three greatest European competitions. In 1900 it participated in its first Federal championship, but it didn't pass, not even the qualifiers. The first true success came in 1905 when Juventus won the first qualification of Champion of Italy. 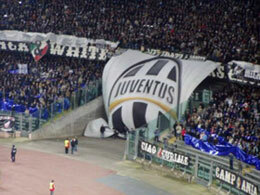 Juventus is the team that has the greatest number of fans in Italy. Further to the measures which have been taken concerning 'Calciopoli', presently Juve is taking part in the championship of Series B for the first time in its history.